Continuing in our series on how to make your life easier if you’re hosting a Thanksgiving dinner, this week we’ll be tackling the bird itself. If you missed the previous two posts, I’ve already given tips on desserts and the most common side dishes. While the purpose of these posts is to show you how to make Thanksgiving easier on yourself, I would argue that you should spend the time you saved elsewhere on the turkey. The bird is the main attraction, yet often it’s the worst tasting thing at dinner. The biggest complaint I hear is that the turkey is too dry or bland or both. There are things you can do to assure a moist turkey, but the biggest is not to overcook it. I don’t know whose job it was to scare the public about salmonella poisoning, but if it was the USDA, I think it has to be the most successful government program ever. Not only is it extremely rare to find someone who will actually put stuffing in a bird anymore, there is a strong tendency to cook turkeys to the Chernobyl setting on your oven. I remember the first Thanksgiving I hosted, I asked a long time cook how long I should roast my turkey, and she said something like 6 hours. I planned the timing of my meal accordingly, and was shocked when my meat thermometer told me that my turkey had reached the required internal temperature of 165 degrees in two hours. I’ve cooked 20+ pound turkeys and it’s never taken longer than 3 hours to cook it to 165 degrees in the thickest part of the meat. When your thermometer says 165—TAKE IT OUT! It is cooked. It is safe to consume. Leaving it in longer is only going to make it dry, tough, and tasteless. It will not make the already expired salmonella any more dead. The cooking time for a turkey will vary depending on how large it is and how hot your oven runs, so checking that meat thermometer is key. I have a wonderful Thermoworks one that you stick a metal probe on a long thin cord into the thickest part of the turkey thigh. Once the probe is in the turkey, you put it in the oven and shut the door right on that cord. The other side of the cord attaches to a small digital display. 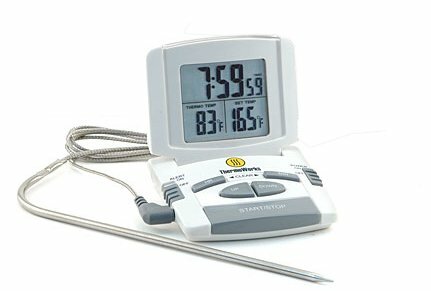 You can set an alarm on the thermometer so that it beeps not after an allotted amount of time, but when your turkey reaches the desired temperature. So I just set my display for 165 and walk away. When my alarm dings, I stick the probe a couple other places to make sure the turkey is 165 everywhere, and then I take the bird out. If you’d like to purchase this marvelous thermometer, you can here. If you can master not overcooking your turkey, then you’ll probably be fine whether you do nothing else fancy to it at all. If you’d like to get a bit more complicated, then here’s my bird ritual. I am not really a big fan of turkey, so I think it needs some help. I buy a fresh Butterball turkey. I don’t buy frozen turkeys because they take days to thaw, and I am not sacrificing that kind of fridge space for that long. Especially since I feel like no matter how careful I am, I manage to somehow get thawing turkey juice oozing somewhere I don’t want in my fridge, and that grosses me out. I don’t know if Butterball is better than other brands, but they are often the only brand I can find that is selling fresh turkeys. Next, I brine the sucker. My sister turned me on to brining. It takes a bit more effort, because you have to soak the turkey in the brine in the fridge (always a challenge finding space for this, too), but it does make the turkey a lot more moist and flavorful. If you want a traditional brine, the Pioneer Woman has one here. I’m going to use a more unusual one this year because soy sauce as a marinade is always magic. 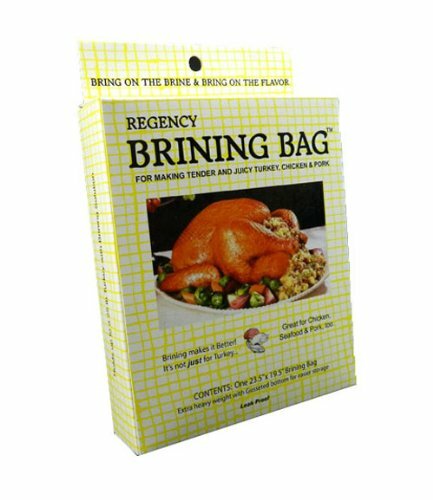 Look for a brining bag, which is essentially a Ziploc big enough to put a turkey and the brine in together. Some grocery stores have them. I found one at World Market. You can also order them here. It’s still a good idea to put the sealed bag with the bird inside of a pot or pan to help you get it in and out of the fridge with less hassle. Once my bird has had a nice soak, I’ll drain it and pat it dry with paper towels. Then I schemer it up good with butter for a nice crispy brown skin. Some years I stuff fresh herbs like sage, thyme, rosemary, and garlic cloves in the cavity and a bit under the skin. I’ll cut up some lemons and shove them in the cavity, too. Then I pop the turkey in at 350 and wait for my thermometer alarm to ring. A good turkey doesn’t take a lot of hands on time, but it does take preplanning and a number of steps. After you take the turkey out, make sure you let it rest for 15-20 minutes so the juices can do their thing. As for carving the turkey, I’ll admit I have never done this myself. I have always handed it off to a willing guest. However, this You Tube video shows you how it’s done. I don’t stuff my bird, so this is always made separate in my house. In fact, I put it on my side dish sign up, so I often don’t make it at all. Because of this, I have tasted many different kinds of dressings over the years. This seems to be the one side dish that people get the most violently opinionated about. Every family seems to have one way it must be done, period. If that’s the case in your house, then avoid the fight and make the dressing that has been decreed. 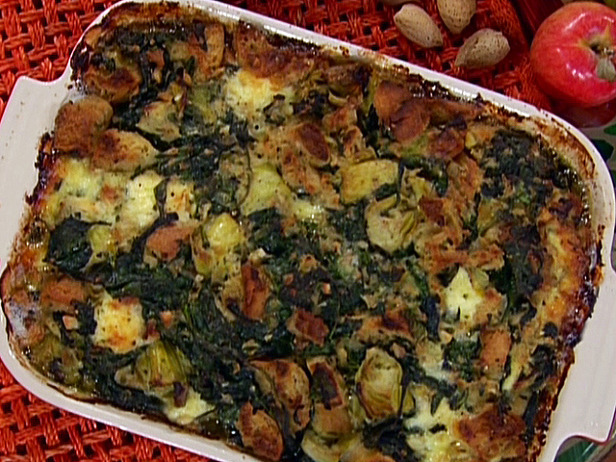 If you actually have a choice, Emeril’s Spinach and Artichoke Stuffing is easily the best dressing I have ever tasted. My sister made it one Thanksgiving when she was a vegetarian and we didn’t have turkey. She figured as long as we weren’t going to do things the traditional way, we should really get crazy and shake things up. You can use frozen spinach instead of cooking fresh spinach to cut down on the prep time. Every time I make it, people just gush over it.